On the evening of January 11, the “Elegant Hunan Opera �C the Operatic Circle Celebrating Spring Festival” 2019 Hunan Opera and Music Spring Festival Gala was staged at the Meixi Lake International Cultural and Art Center Grand Theatre. Li Yuan, the national first-class actress of the Yueyang Baling Opera Heritage Institute, made a wonderful appearance. Her song “The Ode to Plum Blossom” showed the unique Baling style, bringing a wonderful feast to the audience. The Hunan Opera and Music Spring Festival Gala was hosted by the Hunan Provincial Department of Culture and Tourism. This year, based on the continuation of the last three years’ traditions, it introduced traditional arts in the form of elegant concerts and highlighted the theme of the opera concerts, creating a new year festive atmosphere. The gala was divided into three chapters: the Operatic Circle Celebrating Spring Festival, Female Artists Performances, and Elegant Odes to the Spring. Famous artists performed selections of more than 10 ancient local operas in Hunan. 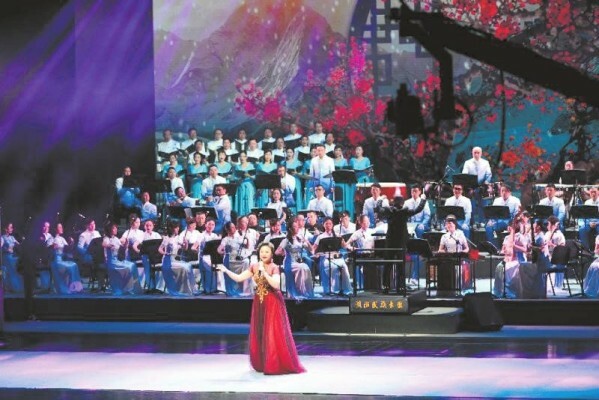 The new outstanding dramas of the 2018 Hunan Arts Festival were also staged, presenting Hunan regional music and singing the praises of good life. Li Yuan is the provincial representative inheritor of Baling Opera, a member of the China Theater Association, and vice chairwoman of the Yueyang Theater Association. She has won the Hunan Young Actor/Actress TV Grand Prix performance award twice and the Hunan Tianhan performance prize twice in her forty-year career. She was also presented the Sanxiang Star Award Golden Prize and the Yueyang Literature and Art Award for many times. This was the first time she has performed with a large band and choir, giving the Baling Opera a new appearance. After watched the performance, the audience acclaimed: “The original Baling Opera is so beautiful!” Li Yuan said that the performance is quite a success, and in the future, she will work harder on innovation and better pass on the Baling Opera.